WHAT HAVE YOU BEEN WAITING FOR THAT WILL FINALLY MAKE YOU HAPPY? Is it a lottery ticket? A rich uncle? A huge, mysterious payoff? Let the waiting finally be over and discover that you already have what you truly want - happiness. It's there inside you, ready for you to access it. So what's the secret to finding it? Using your imagination. And Paula Sullivan has done just that - her imagination has led her to developing and exploring new practices you can use to achieve happiness simply by changing your thoughts. In Simply Being Happy, she'll teach you how to strengthen your imagination just like any other muscle so it can bring you the results you want. In these pages, you'll discover how to: Change your thoughts about money from scarcity to abundance. Accentuate the positive in your life. Pay attention to the words you use and thoughts you think. Reprogram those words and thoughts into life-altering positive ones. Learn to spot your own Doppelgangers for self-improvement. Access your inner wisdom so you always know what is best for you. Create your ideal day and your ideal lifestyle for the rest of your days. Are you ready to live the life of your dreams? Are you ready for the happiness you've always craved and know you deserve? Then start creating it now by reading Simply Being Happy. Paula Sullivan is an author and researcher who has developed her own unique style of visualizations. A former newspaper reporter and business owner, she has been researching the subject of happiness for the past several years. Pouring over hundreds of books covering everything from ancient teachings to modern scientific studies, she believes the answer to attaining true and long lasting happiness lies in the images people hold in their subconscious minds. Simply Being Happy is her guidebook to teach others the techniques for replacing their negative images with new, bright, and powerful ones to create more happiness in their lives. Paula and her husband, Jim, have been married for over twenty years and have three grown children: Jimmy, Tara, and Christine. They reside in Blackstone, Massachusetts. 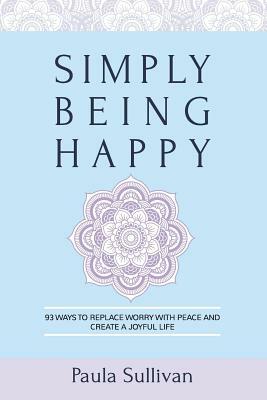 Praise For "Simply Being Happy" by Paula Sullivan it's like a breath of fresh air. Her writing style and humor, along with all her teaching and tips, will engage the reader and possibly change their life. Highly Recommended Self-Help Read!